I would just like to take a moment to compare my current life to my life during the first year of NaBloPoMo, 2006. I know I do my big “look at how grown up I am” retrospective every year for CK’s anniversary, but 2006 vs. 2011 makes for an especially interesting comparison. Not only because it’s a shorter amount of time, but because I took the opportunity of the 2006 event to come out as a “secret rock star” who was beginning to take music more seriously (as if I ever took it less seriously). 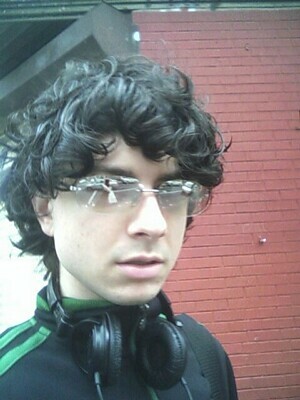 Me in November 2006. I will never get tired of how I look both cute and totally ridiculous in this photo. In November 2006 I had just started a new job, and I was the junior-most person in the department. I didn’t have to stay late too much and took lunch breaks. My round-trip commute was 72 minutes by SEPTA or on foot. My home office and recording studio were crammed together into my teeny 2nd bedroom (also my dressing room), which was barely big enough for a twin-sized bed. I mainly played two guitars – a brand-new Breedlove acoustic and my red Epiphone electric. I had been dating E for four-and-a-half years. I was an incorrigible night owl. There was no Twitter. I hadn’t written anything longer than a blog post for fun since high school. I didn’t spend money on anything in specific, though I had just gone to Bonnaroo and went out drinking a lot. I was just starting to save for an engagement ring. 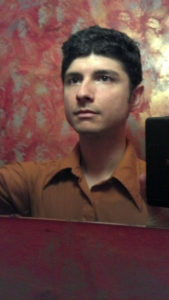 My now-traditional backstage pic in the Tin Angel bathroom, from just before Arcati Crisis's full-band debut gig this September. In November 2011 I work in the same area, now as one of the more senior members of my department. Sometimes I have to stay late just to get some quiet time, and I hardly ever take lunch breaks. My round-trip commute is anywhere from 80 to 100 minutes. I rehearse about six hours a week with my pair of rock bands. I have played at least one show each month of this year, but not a single time as a solo artist. I had to give up open mics because they aren’t very rewarding. I have a repertoire of close to 40 songs with Arcati Crisis, and another 20+ with Filmstar, and another 20-30 solo. I’ve been too busy working through a backlog of my own new songs from last year to do much writing, but generally am working on a mix of acoustic dance songs and ballads. My home office twice the size of the old multi-purposes room, and is dedicated just to writing and reference. My separate home studio is about as big as an entire floor of our old house. I mainly play the same two guitars plus a baritone, but I’ve also added a trio of basses and a pedal board full of effects. E and I have been married almost three years. I hate staying up past midnight. I’ve been copy-editing the first 200 pages of my novel for the past eleven months, and I’m presently writing the second half. I have developed a serious collected comic book addiction in addition to keeping up our band equipment. I haven’t been on a vacation since our honeymoon. I have mostly given up drinking in bars. I’m just getting back to some semblance of savings after buying a house and all of my bass gear. I guess my point is not only, “whoa, dude, you really did some growing up,” but to put the idea of blogging daily and recording songs into perspective. In 2006, what the hell else did I have to do with my life but blog every damn day? Seriously, I had exactly nothing going on. I got home every day by 6pm and went to sleep at 2am. That’s eight hours to dream up a meagre 500 words and record a three minute song. In 2011 there are weeks where my life is scheduled down to the minute, and blogging is only on the schedule every second Sunday. It happens in found moments, largely on the El (ugh). I spend so much time rehearsing music and writing communications plans at work that the idea of vomiting up another 500 words for a blog post can seem like it might be physically painful – let alone the requisite 1666 daily words for my novel. I needed 2006 to get to 2011. I couldn’t have jumped right into the present day me. It took blogging daily and recording 30 songs in a single month to remind me of what I was living for. Things only got more interesting from there. What about you? What was your life like five years ago today? What’s the biggest difference? Would you-of-2006 be happy to see what you’re up to in 2011? the future is here; where is my jetpack? how do you know what sore is?